Best Western Edinburgh City Hotel is suitable for the family, those who want a peaceful getaway or for people on business.Everything a tourist needs right on your doorstep. The hotel is an impressive Victorian style building. 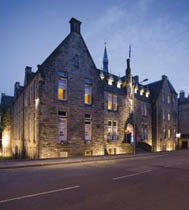 Whilst many of the orginal features have been preserved the hotel still manages to be fit for the modern family. You will find it within walking distance of the city centre and museums, art galleries and the Castle (famous for the Edinburgh Fringe and the Royal Military Tattoo festival in August/ September time). The hotel has 52 rooms ranging from twin rooms to accessible rooms (for those who are disabled or for those elderly who struggle to walk up stairs). These rooms are found on the ground floor of the hotel. Each room is equipped with an en-suite bathroom, a TV, trouser press, a hairdryer and tea and coffee making facilities, as well as Wi-Fi. If you fancy a day out into Edinburgh, then the Castle is around a 15-20 minute walk. If you or the kids are animal lovers, then Edinburgh Zoo is an hour walk or a 10-15 minute drive from the hotel. This fine establishment is perfect for people who want to enjoy the sights of the beautiful capital city of Scotland. Wi-Fi is available in every room. Trouser press and Hairdryer in each room. Emergency cord in the accessible rooms.